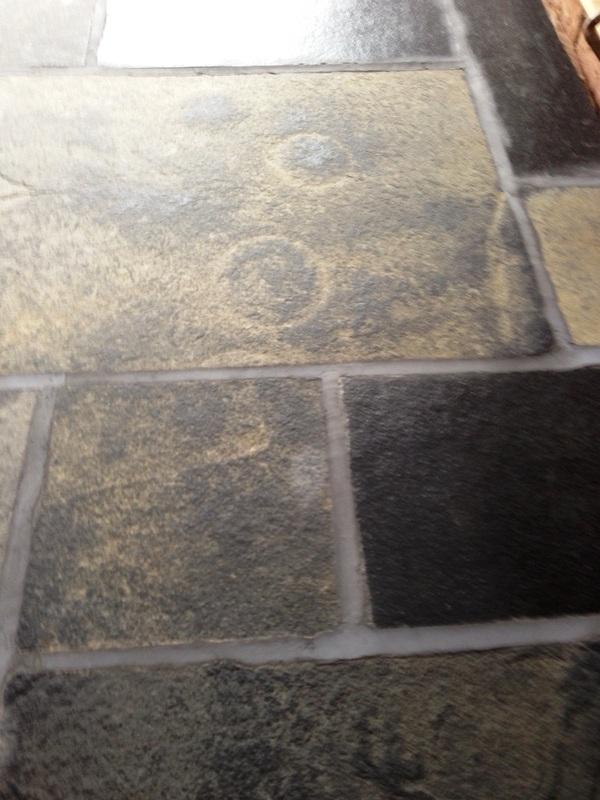 I was asked to strip and re-seal these interesting Chinese Slate tiles that were installed in the kitchen floor of a property in Hale Barns, Cheshire. 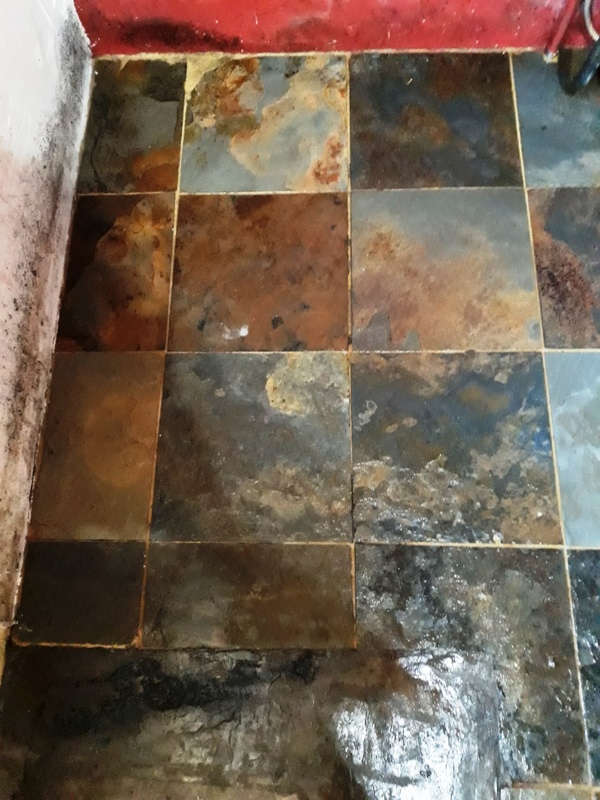 It seems the tiles had been re-sealed over the years without giving them a deep clean first resulting in dirt and grime being sealed in between layers of old sealer making them impossible for the customer to clean. 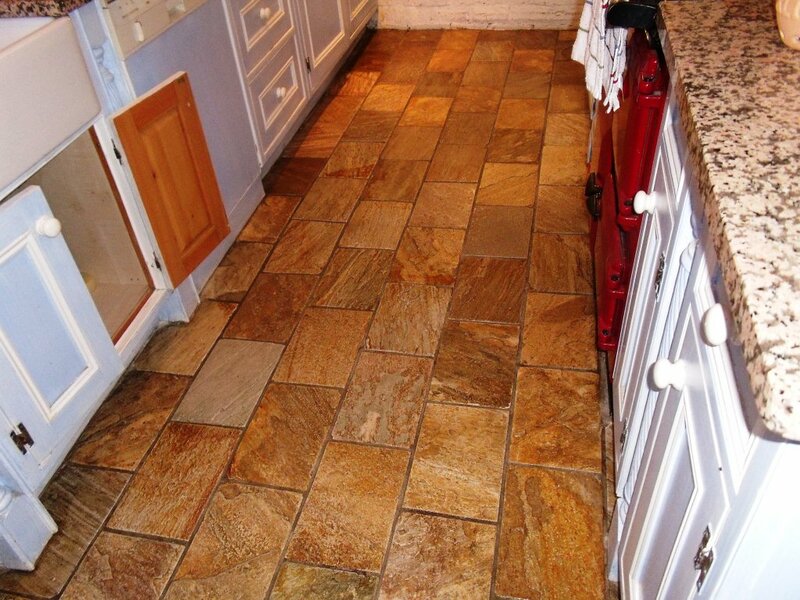 To remove the many layers of sealer and get the tiles clean I let them soak in a strong dilution of Tile Doctor Remove and Go which is a coatings remover for the stripping of sealers from floors that is safe to use on Tile, Stone and Grout. 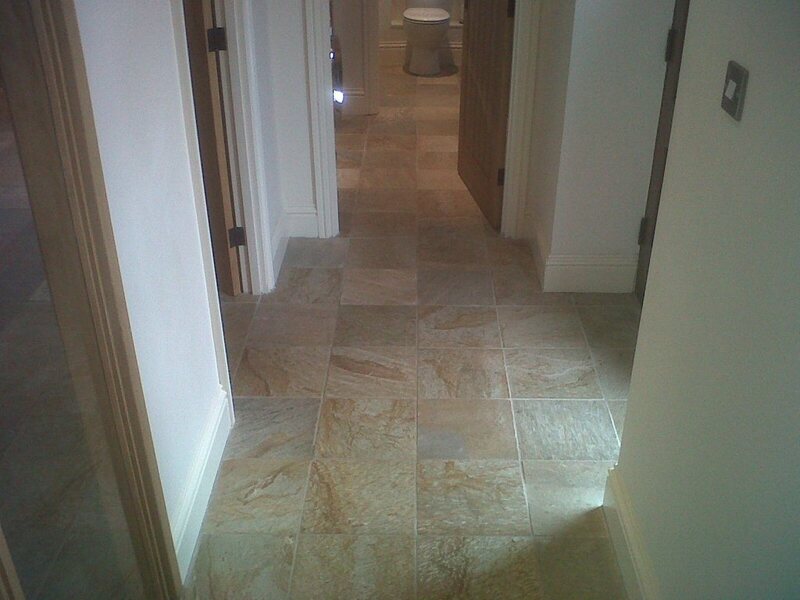 This was worked into the tile and grout using stiff brushes followed by steam cleaning the floor. 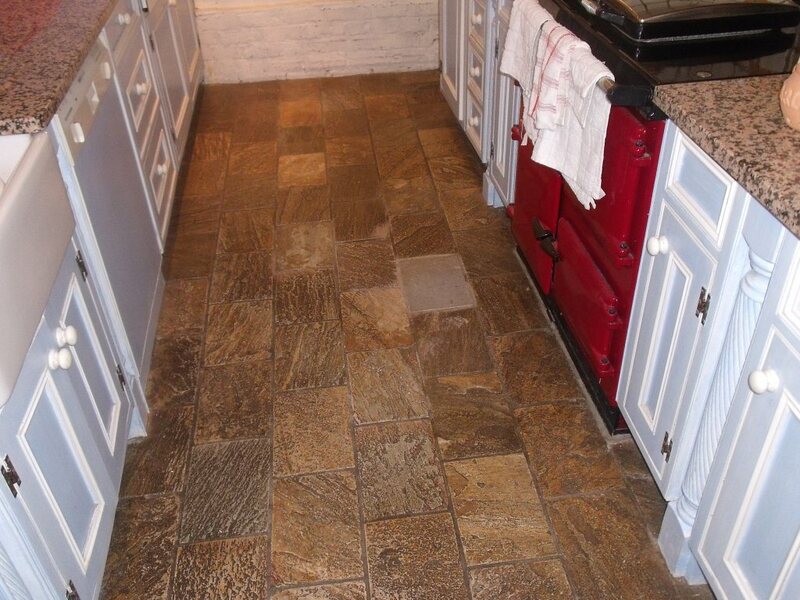 The resulting soiled solution was removed and the floor washed down with clean water to reveal the bare stone; stubborn areas were re-treated using the same process before leaving the floor to dry before sealing. 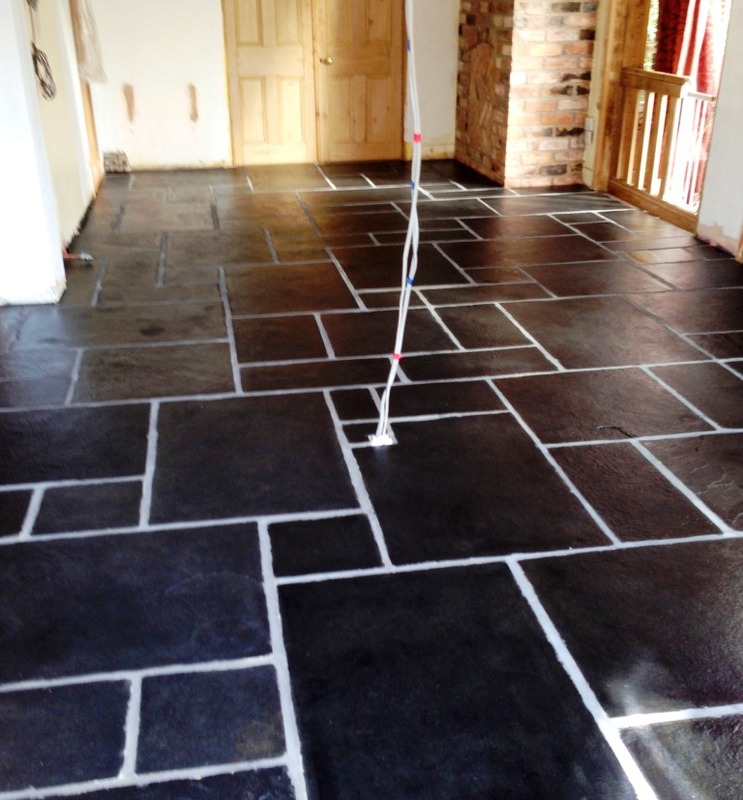 Once I was satisfied the floor was dry it was sealed using Tile Doctor Seal and Go which is a highly recommended sealer for slate that leaves an attractive low sheen finish and smooth surface, it’s also a water based sealer so there is no smell. 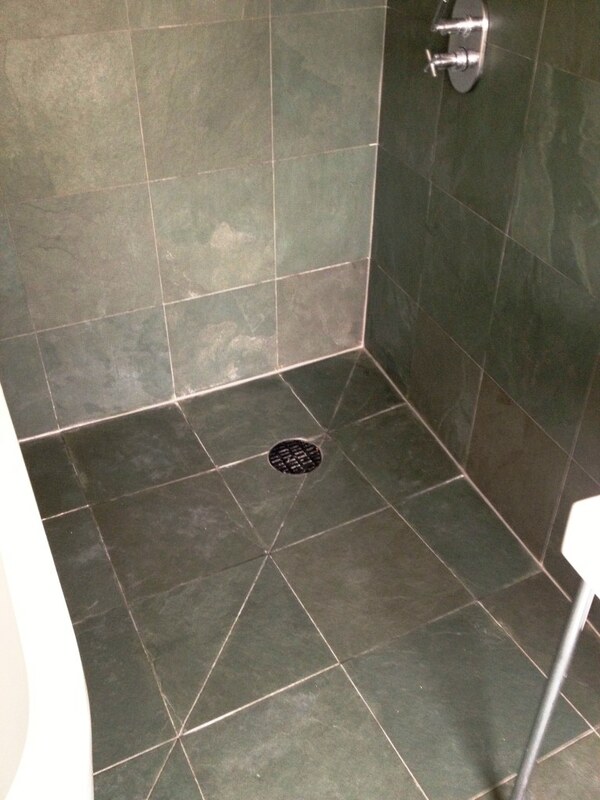 This bathroom in Richmond, Surrey was tiled in Slate on the walls and floor to create a wet room effect. Overtime the old sealer had perished allowing soiling and shower products to stain tile and grout there was also evidence of heavy Limescale deposits. We decided to give the tile and grout a deep cleaning using a strong mixture of Tile Doctor Pro-Clean combined 50/50 with Nanotech Ultra Clean to make it more effective. To get the cleaning solution to stick to the wall tile and grout it was decanted into a spray bottle and sprayed on to the tile, this combines it with air making it lighter and allowing it to dwell on the vertical surface. 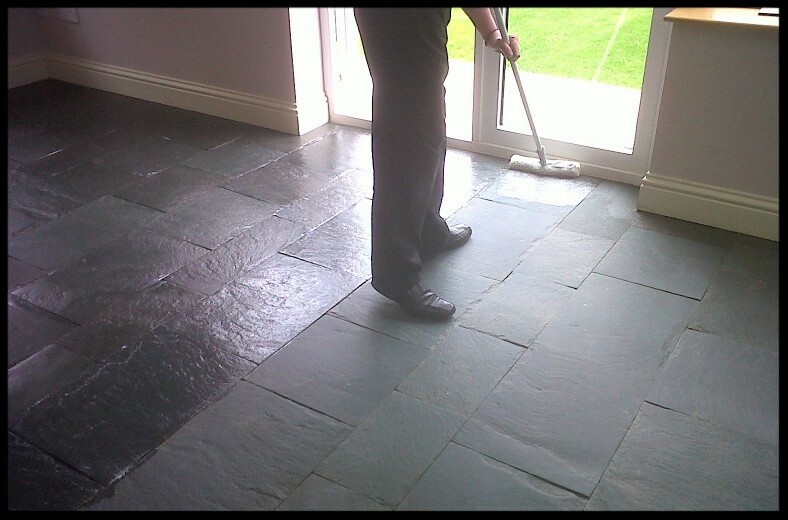 The solution was then worked into the Slate tile and grout by hand using a stiff scrubbing brush and then washed off using clean water, this process had to be repeated a number of times until we were happy that the tile and the grout were clean again. Pro-Clean is also an effective sealer stripper so will have removed any remaining sealer from the surface, this is important as the new sealer may not have been compatible with the old. There were a number of areas that had stubborn Limescale deposits so we treated them with Tile Doctor Remove and Go which is a very strong product that as the name suggests will pretty much remove anything but is safe to use on Tile and Grout. Once this process was complete the whole area was given a thorough wash down with water a number of times to remove any remaining chemical and neutralise the surface ready for sealing. 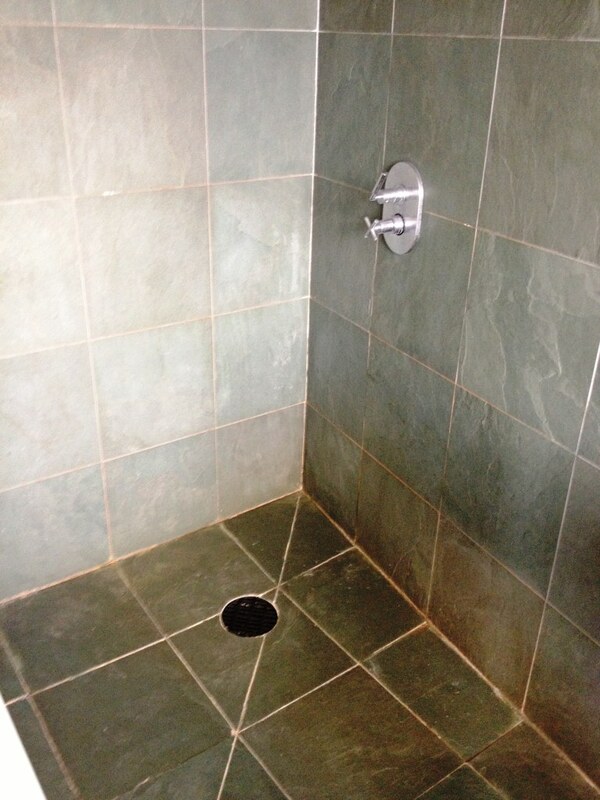 We left the floor to dry off overnight and came back the next day to re-seal the tile and grout. 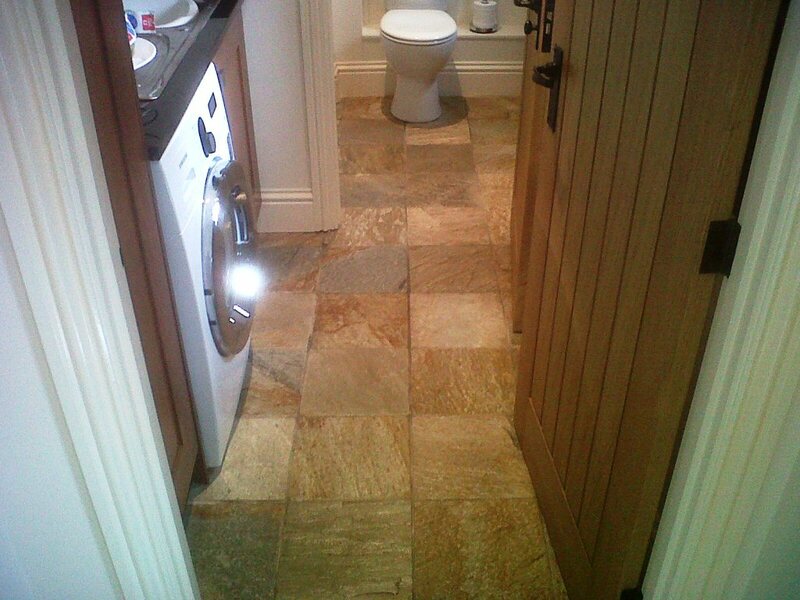 We choose to do this with Tile Doctor Colour Grow which is an impregnating sealer that will sit in the pores of the tile and grout rather than on the surface and help protect it for longer, it’s also a great product to use on natural stone such as Slate as it really brings out the natural colours in the stone. Jon was friendly and professional, working to a very high standard and keeping me well informed throughout the process. 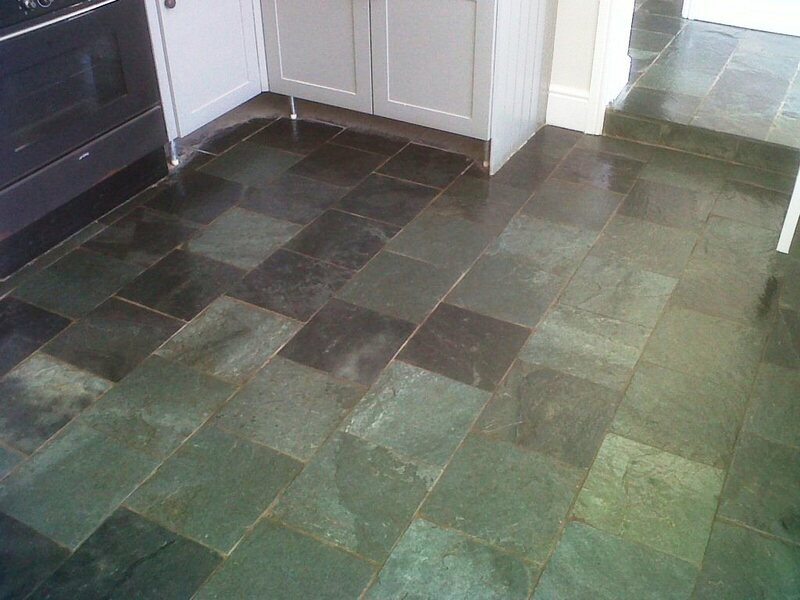 This slate tiled floor was installed in the Kitchen of a house in the town of Bridgenorth which is in the Severn Valley Staffordshire. 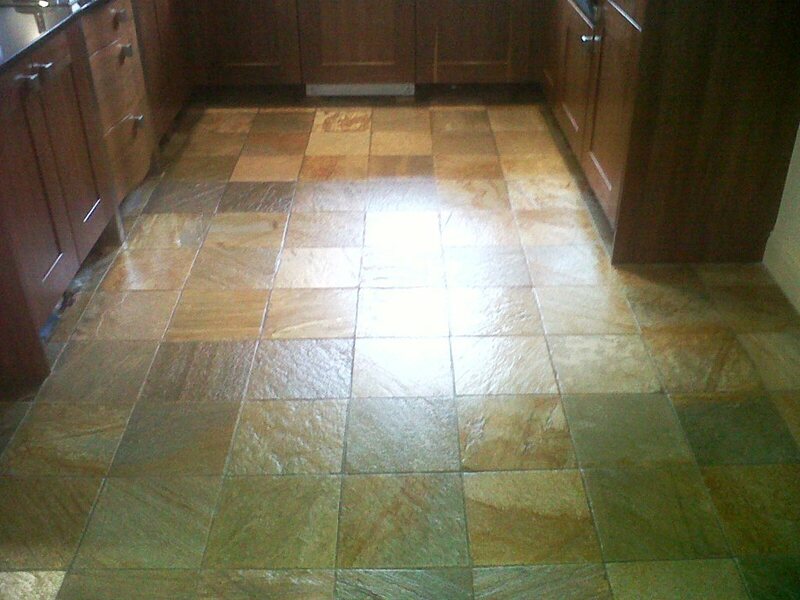 The owner of the house wanted to have the floor deep cleaned and re-sealed and so gave us a call. We set about cleaning the kitchen floor with a mixture of Tile Doctor Pro-Clean mixed 50/50 with Tile Doctor Nano-tech Ultraclean which was worked into the pores of the slate tile using a slow speed rotary machine fitted with a Polyscrub scrubbing pad which can reach down into grouting as well as scrubbing the floor. I then used a wet vacuum to remove the resultant soiled solution before rinsing the floor down twice with cold water, this also neutralises the floor prior to sealing. I left the floor overnight to dry then came back next day and used a damp test meter to verify the floor was dry and ready for sealing. 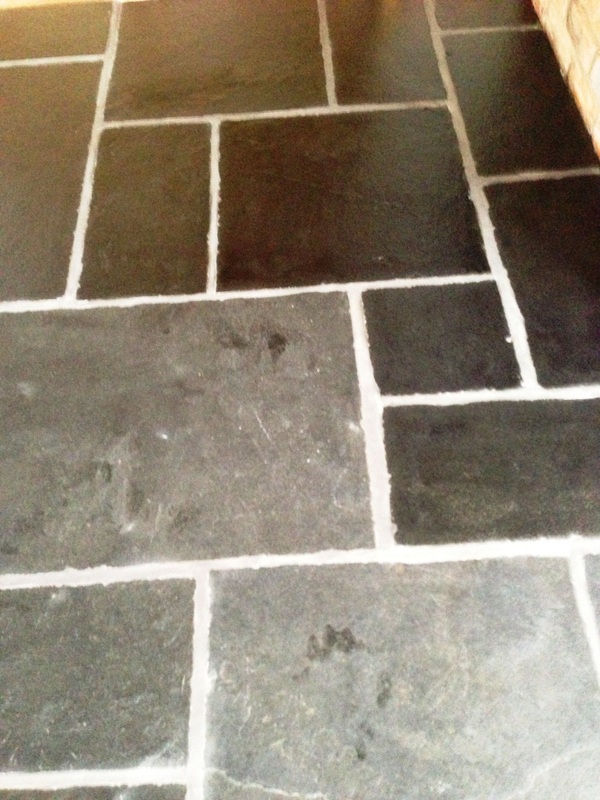 Once happy I proceed to apply three coats of Tile Doctor Seal & Go which as you can see from the photograph below has really brought out the natural colours in the slate. 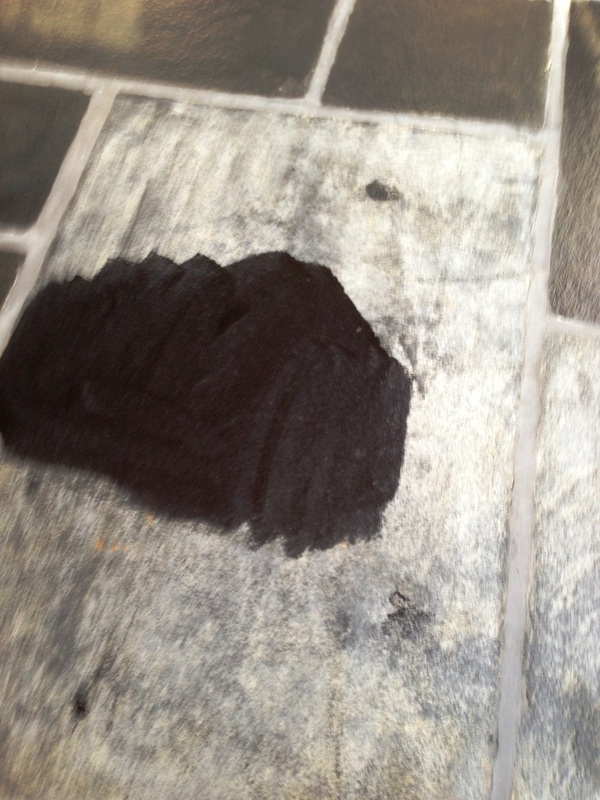 I used a water test after the third coat was dry to see if the water would form bubble on the surface thus indicating it was dry, which it did thereby indicating the floor was fully sealed. Overall the job took two days and I’m happy report the customer was delighted with the outcome. 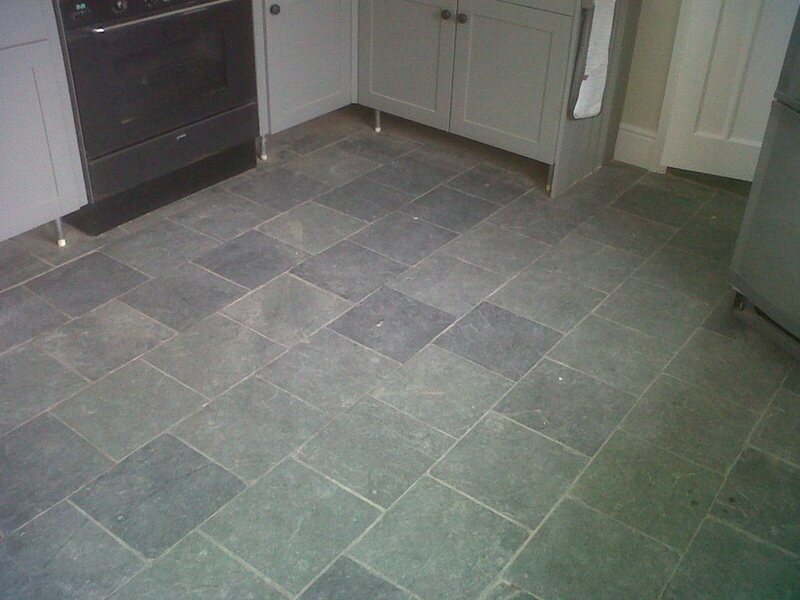 This slate tiled floor was installed in a Kitchen in Burton on Trent, Staffordshire. The owner of the house felt it was time to get it cleaned and re-sealed so gave us a call. We set about cleaning the kitchen floor with a mixture of Tile Doctor Pro-Clean mixed 50/50 with Tile Doctor Nano-tech Ultraclean which was worked into the pores of the slate tile using a slow speed rotary machine fitted with a Polyscrub scrubbing brush which can reach down into grouting as well as scrubbing the floor. I then used a wet vacuum to remove the resultant soiled solution before rinsing the floor down twice with cold water, this also neutralises the floor prior to sealing. Overall the job took two days and I’m happy report the customer was amazed with the outcome and very pleased. 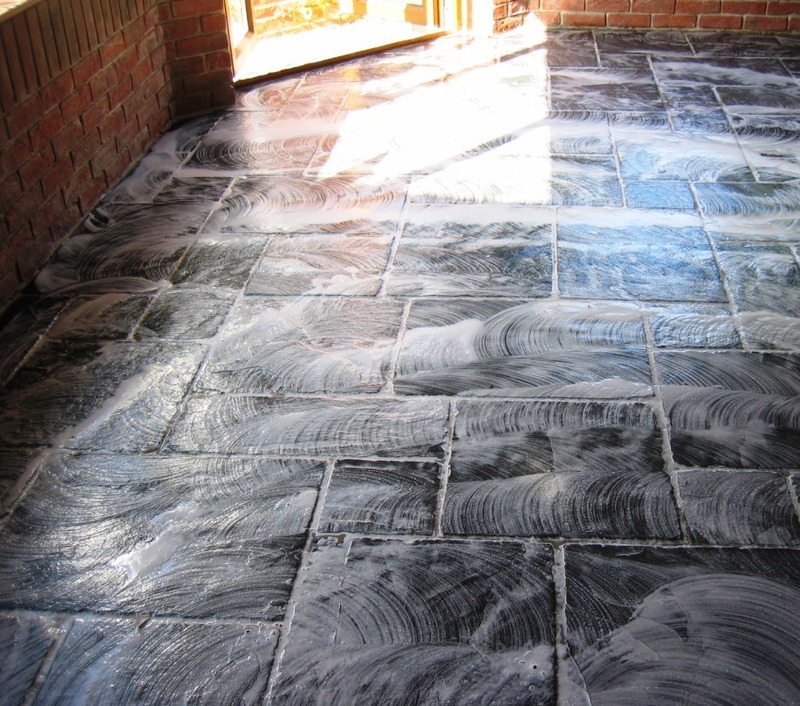 These Slate flagstone tile were installed in a conservatory in the town of Fareham. 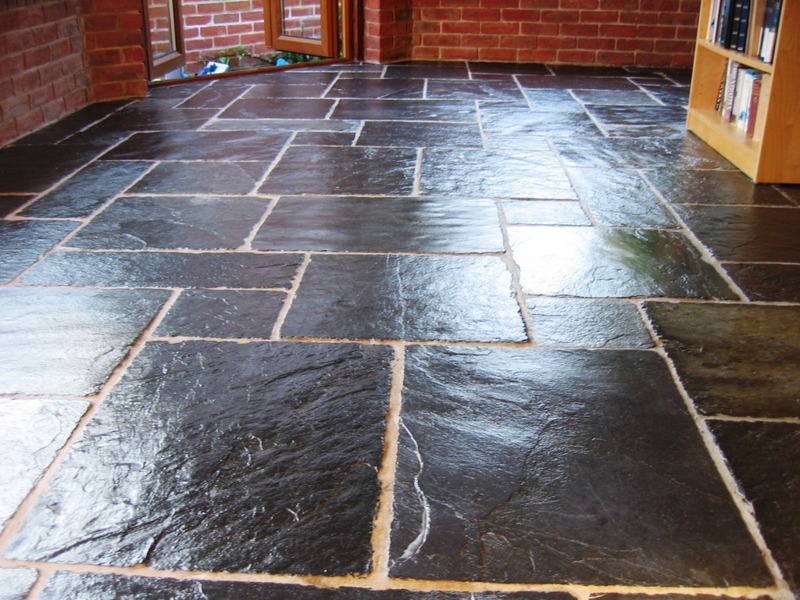 The flagstones and grout were reasonably clean and in good condition but the previous sealer had all but worn off and they were looking dull and in need of revamp. As the previous sealer had all but worn off I decided not to apply a dedicated coatings remover product such as “Remove and Go” but instead use a strong cleaning solution to remove the remaining sealer and clean the floor in one go. For this I choose a strong dilution of Tile Doctor Pro-Clean mixed with 50/50 with Nanotech Ultra-Clean which adds tiny abrasive particles to the mix. 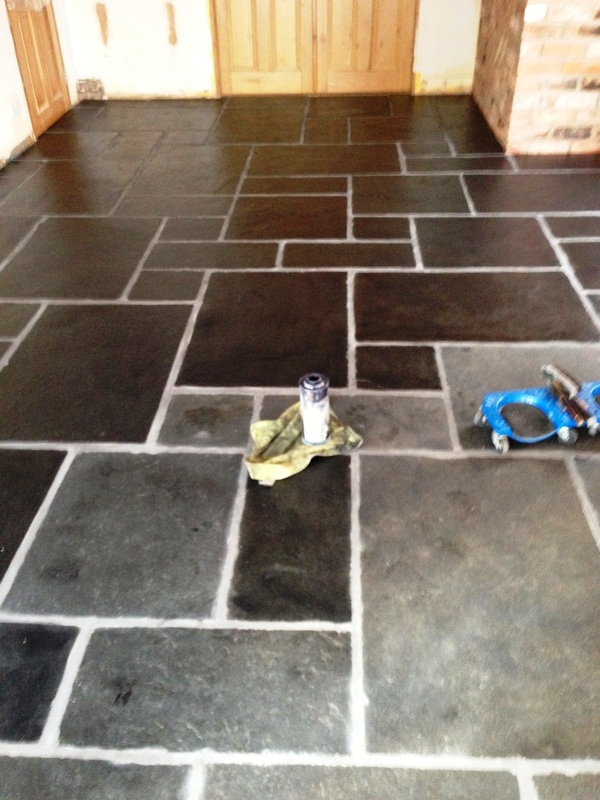 The cleaning solution was applied to the floor with a mop and then left to dwell for 20 minutes before being agitated with a buffing machines fitted with a black Scrubbing pad and stiff brushes along the grout lines. The soiled solution was then removed using a wet vacuum and the floor rinsed with clean water and left to dry. We could see at this point that the job was a success and we had successfully managed to clean the floor and remove the sealer in one go. There was no history of what had been used to seal the floor previously so it’s important to ensure all the old sealer had been completely removed as the old sealer could have been incompatible with the sealer we wished to use and resulted in an unexpected finish. 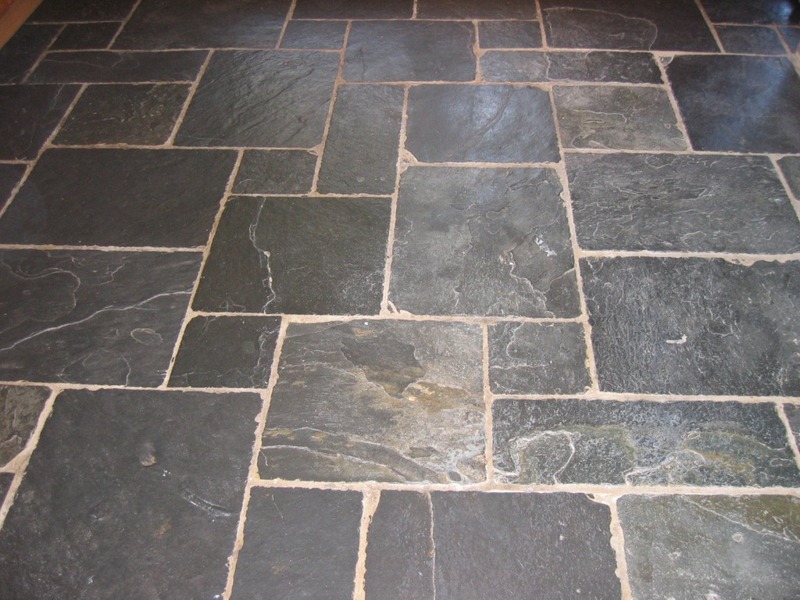 We sealed the slate flagstones with a single coat of Tile Doctor Colour Grow which really helps bring out the deep colour from within the slate. To finish and build up the lustre and richness of the colour we then applied seven coats of Seal & Go which add a nice low sheen to the surface of the tile. For general cleaning and to get a long life out of the sealer we recommended the use of Tile Doctor Neutral Cleaner, diluted 1:30 with water and applied with a microfibre flat mop, rinse with water and then remove with a clean microfibre flat mop. 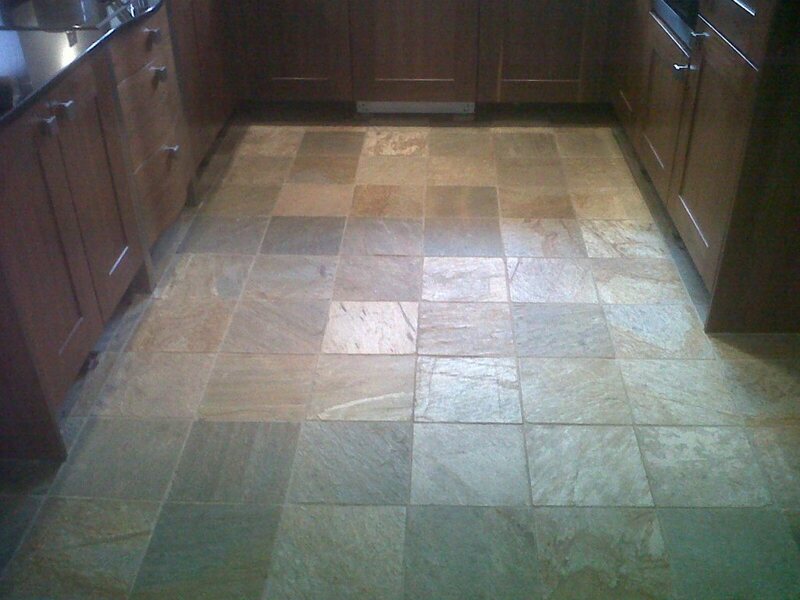 This Slate tiled kitchen floor at a house in Royal Leamington Spa needed a full clean and seal plus some of the tiles were reclaimed having been used originally outside and as well as loosing colour were suffering from salt damage. To remove the sealer, clean the floor and tackle the salt damage the floor we used a 50/50 mix of Tile Doctor Pro-Clean and Nanotech Ultra-Clean worked into the floor with a buffing machine fitted with a black scrubbing pad. This product combination creates a powerful cleaning solution with Nano sized abrasive cleaning particles that’s ideal for cleaning difficult floors. It’s also very good for cleaning up grout however I find that’s best tackled manually using a stiff brush. 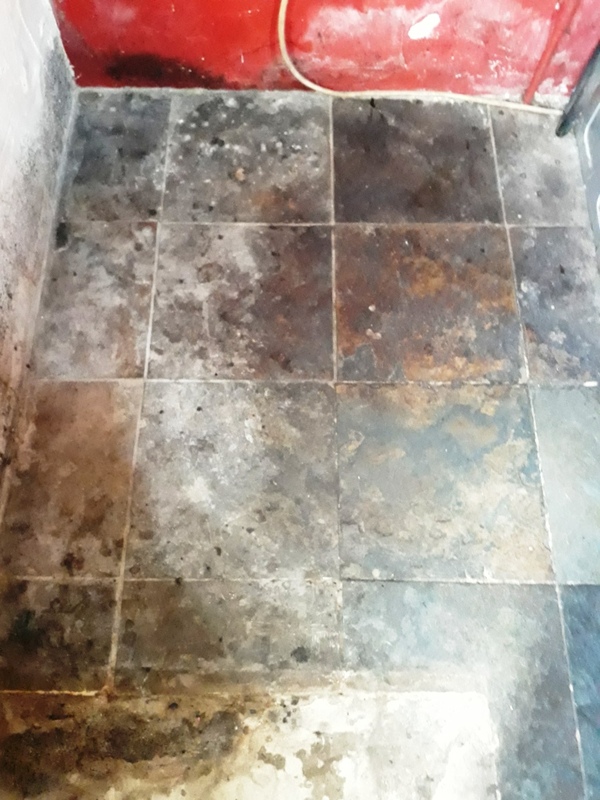 The next step was to remove the salts from the floor, this problem is more commonly known as efflorescence and results in white salt deposits being left on the surface of the tile, the only way to remove it is with an strong acidic cleaner such as Tile Doctor Grout Clean-Up, you do need to be careful not to allow it to dwell too long as it can damage the tile surface. Last step in the process was to remove the soiled cleaning solution with wet vacuum and then wash down the whole floor with clean water in order to neutralise it before sealing. We have invested in a powerful indoor spinner tool for this purpose which is a fantastic product that applies and removes water under high pressure. We then left the floor so it could dry overnight. 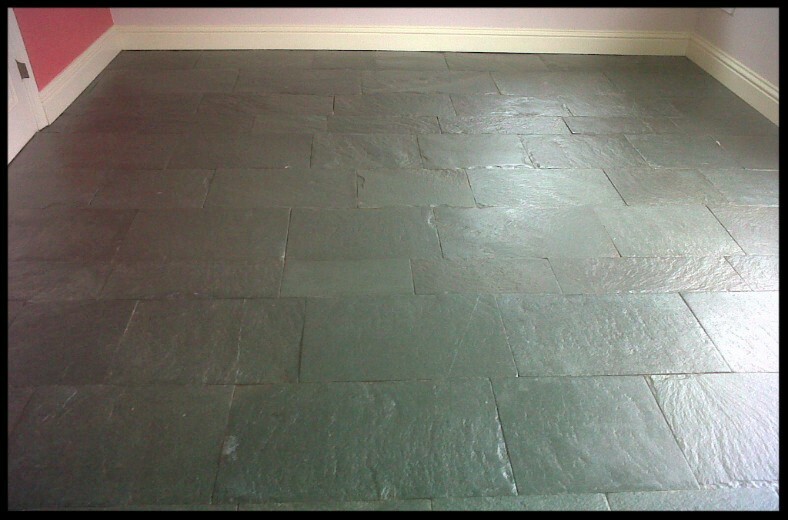 The reclaimed slate tiles were a different colour to the rest and the owner was keen to have them dyed to make the floor uniform, fortunately we access to an industrial stone colouring product and were able to apply this to darken the stone. The next step was to seal the slate floor and for this we applied a coat of Tile Doctor Colour Grow which seals and deepens the black colour of the Slate, the floor was left to dry fully and then we applied a further three coats of Tile Doctor Seal and Go to bring out more colour and add a low sheen.